Kaweco has updated their old 1900s dip pen design into a new entry-level, full-size fountain pen--and I'm quite smitten with it. The Kaweco Perkeo is a cartridge/converter pen. It takes standard international sizes, so there's no need to fuss with the dreadful Kaweco mini converters. Each pen comes with a short blue cartridge. It's a bit of a shame that they don't come with converters--be sure to toss one in your cart if you're buying one of these pens. The Perkeo is available in four colors: "Bad Taste" in cherry and black; "Cotton Candy" in pink and grey; "Indian Summer" in black and slime-green; and "Old Chambray" in a pale off-white and blue. They're all fun and attractive color combos, and it's incredibly fun to mix-and-match the bodies, sections, and caps. I won't even confess to how much time I've spent swapping them around. The caps show the familiar Kaweco faceted silhouette. They are octagon shaped and a bit wider than the Sport caps--so the Kaweco clips will not fit on these pens. I hope they plan to release a clip for this model soon. At the top of the cap is a Kaweco brand medallion. The body has many narrow facets and looks quite sleek and elegant, I think. The section has two color bands that match the cap color. The section is slightly molded for a triangular grip. It isn't as intense as the Lamy Safari grip, but it's a similar idea. If you don't have a triangular pen hold, it could potentially be intrusive for you. I don't quite understand why any pen manufacturer would fit their product in such a way to limit their audience, but there you go. They do feel perfectly comfortable for me, but you may want to try holding one before you commit to the purchase if molded grips cause you grief. The lightweight plastic has a matte finish, but is very smooth to the touch. The snap cap is quick and handy but gives a good seal. After leaving the pens idle for nearly a week, only one needed any priming to get started again. The cap posts very nicely and securely. The bodies are long enough to carry a spare cartridge, if you're using the short size. If you partially unscrew the barrel, you can peek at your ink level through a clear thread piece. It's not terribly easy to see through the threads, but it does give some idea of ink level. There are holes at the bottom of the barrel--so no eyedropper filling for this pen unless you seal the bottom very securely first. I think that's a missed opportunity for these pens. The nibs are friction fit, but very difficult to get out. I'd recommend not trying unless there is a pressing need--and be careful to not damage the nib as you pull. They also seem to be slightly different in shape than the Kaweco Sport nibs. They're number five nibs, but they're longer and a bit narrower in wingspan. This shape may contribute to the surprising springiness of these nibs. I got a lovely bit of line variation when putting a pressure on the nibs. If you're careful not to spring the steel, you can get some great character in your writing. The nibs are all quite smooth and seem to get a good ink supply. I've tried them with Kaweco, Diamine, and Monteverde ink cartridges, and all have been delightful. The pink and blue pens come with silvery steel nibs, and the black and slime pens come with an almost iridescent blue-black nib. My overall impression of the nibs is that they are good quality but bad consistency. All write pleasantly and well--but they all write a bit differently, despite all being a fine point. The lines vary a bit in width, and some nibs seem firmer or offer more feedback than others. Even the coating on the darker nibs seems different between the two pens. While I don't mind this inconsistency so long as they all write well, it does point to some concerns about quality control of the nibs overall (which isn't a new issue for Kaweco nibs). Despite my few small complaints, I'm enjoying these pens a lot. They're light, durable, inexpensive, and fun. 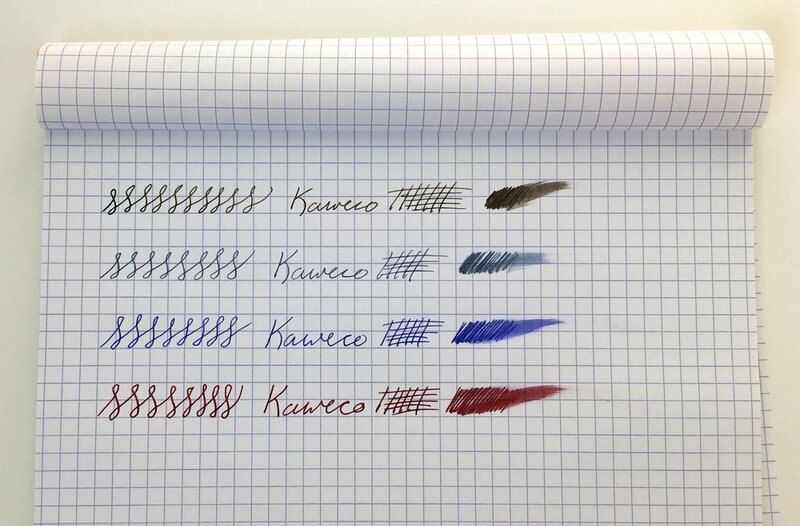 I'm hoping for more great color combos in the future (so I can continue to play LEGO pens) but I think Kaweco has a great, competitive entry-level pen, here. If you have these already, I'd love to see your color combos! Posted on September 7, 2017 by Sarah Read and filed under Kaweco, Fountain Pens, Pen Reviews.